From September to December last year, a group of students from the University of Bristol took part in the These Walls Must Campaign. The initiative to start the campaign came from a student involved with the university Amnesty International group. All political and activist societies at the university were invited to get involved, with the hopes of creating a cross-party movement. Indeed, alongside students involved with Amnesty, there were representatives from Labour, the Green Party, the Liberal Democrats, STAR, Global Justice Now and People & Planet, making for a truly collaborative and nonpartisan team of campaign co-ordinators. These Walls Must Fall has seen success in cities such as Manchester and Brighton and we believed it was time that Bristol followed suit, given the high number of asylum seekers residing in our city. Our aim was to get a motion passed by the Bristol City Council, committing the council to call on the Government to implement the recommendations of the All Party Parliamentary Inquiry into detention. The motion also proposed that the council must ask our local MPs to support the spirit of the motion, to continue to raise the matter in the House of Commons, and to support changes in current laws and procedures which would introduce alternatives to detention. The more we learnt about the flaws of the UK’s current immigration detention system, the more our motivation to win this campaign increased. If I were to list all of these problems in this article, it would make for a very long read so I recommend that the reader educate themselves with a few Google searches if needed. 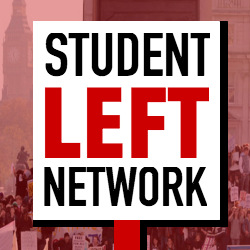 I’m sure most members of the Student Left Network are already familiar with the struggles of residents at the likes of the notorious Yarl’s Wood. Home Office reports themselves are damning condemnations of the conditions in these privately run detention centres. Our campaign was filled with direct action which escalated over the three month period. Online and paper petitions were distributed with the aim of collecting as many signatures as possible in order to show Bristol councillors that this was an issue which residents felt strongly about. Additionally, many letters in support of the campaign were written and sent off to councillors, particularly to those who were less likely to be supportive in the hopes of swaying their vote. Campaign coordinators frequently went door-knocking in both student halls and residential areas, intending to raise awareness and collect signatures. One of the highlights of the campaign was the launch party held in Bristol’s beloved Hamilton House. The launch party was again aimed at raising awareness around the campaign in addition to encouraging people to get involved whether that meant participation in direct action, contacting their councillors, or simply signing the petition. At the launch, we had a brilliant speech from someone with first-hand experience of the detention system, as well as an inspiring address from Bristol West MP Thangam Debbonaire. On top of all this, we also managed to coordinate a banner drop over the M32 and a march through the city centre. The march was another campaign highlight for us as it was great to be able to work with the wider local community, and non-university based groups such as Bristol Refugee Rights. Although we were determined to get this motion passed and highly active in the run-up to the council meeting in which the motion would be discussed, we did experience a few setbacks along the way. At first it was quite difficult to make the campaign ‘non-unicentric’. It was easier for the team to meet within the university SU building or conduct actions in city centre areas but this meant that the campaign wasn’t as inclusive as we’d have liked it to be. We counteracted this by making regular efforts to contact groups outside of the university and host events in venues that were accessible to all. We came across a few technical difficulties which we were quick to rectify. For instance, we found that our online petition did not do so well, despite our frequent social media posts, and so we swiftly moved to a paper petition, which grew much faster as it was easier for supporters to sign. The removal of our banner from its bridge over the M32 was another disheartening moment, but we can’t moan too much, given that we knew that this was likely to happen. I’m pleased to report that the motion passed on the 11th December, and that the motion was supported by all parties besides the Conservatives. A large part of this campaign’s success stems from the collaborative approach adopted by its organisers. This collaboration not only crossed the lines of our student groups but also connected us to the local community, local organisations, and people with direct experience of the UK’s detention system. However, despite this campaign being a step in the right direction, it is difficult to celebrate its success knowing that there is still so much left to do on this issue: the UK’s detention system is still in desperate need of reform. If you are a student in a city which has not yet had a These Walls Must Fall motion passed, I strongly urge you to take up the campaign because having more cities pass this motion will strengthen the case for reform and will bring immigration detention to the fore of political discourse. Meanwhile at the University of Bristol, student groups are working towards getting the university to cut financial ties with private companies running detention centres, in addition to ensuring that the university continues to be a safe and welcoming place for international students and students who are asylum seekers.